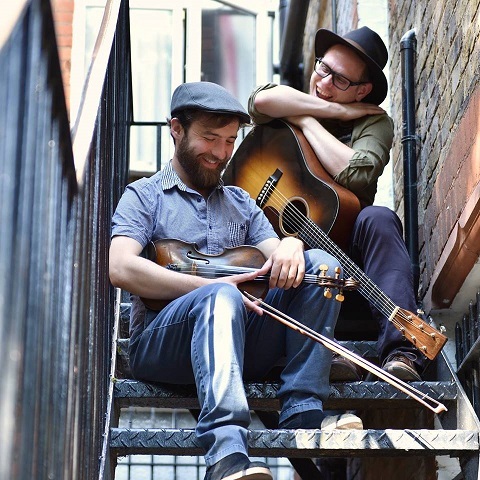 London-based folk-bluegrass duo Copper Viper announce March-April UK tour, opening with three shows at C2C – Country To Country in London on March 8 & 9, in support of debut album CUT IT DOWN, COUNT THE RINGS out April 5, 2019 (iTunes Page). 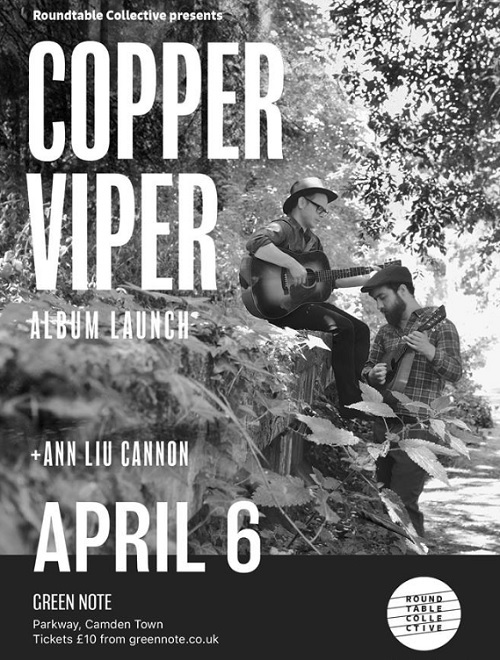 Prior to forming Copper Viper, both members had been active in a variety of musical projects for a number of years. Sangster has performed widely as a soloist and with “Americana Noir” group Affa David, and has written songs for performers across a wide range of genres. Menzies grew up playing traditional Scots fiddle music; since moving to London he has worked with a multitude of artists as a session musician and toured extensively in the UK and Europe as a member of country/rock & roll band Ask Sally and gypsy swing/jazz quartet Harp Bazaar. 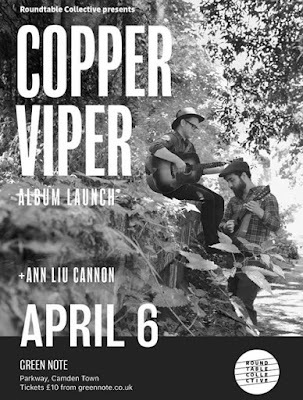 The diversity of these previous musical experiences is strongly reflected in Copper Viper’s music. The duo performed their first public show at the Filey Folk Festival in April 2017, and since then have been honing their live set at folk clubs and venues around the UK. September 2018 saw the group’s first overseas performances, with a European tour taking in Germany, Switzerland and the CarnieFest music festival in Mallorca. 2019 promises to be Copper Viper’s busiest year to date, with confirmed shows so far including several UK festivals, an April UK tour opening for renowned Celtic folk group PerKelt, followed by several dates in Germany & Belgium. In 2018, the group contacted platinum-selling producer Ryan Hadlock (The Lumineers, Brandi Carlile) who agreed to record their debut album at the legendary Bear Creek Studio in Woodinville, WA and was mastered by Grammy-winning engineer Gavin Lurssen (“O Brother, Where Art Thou?” soundtrack, Robert Plant & Alison Krauss). Comprised of 11 original songs and titled Cut It Down, Count The Rings, the album explores a range of lyrical themes, mixing hope, regret, joy and melancholy while maintaining a sufficient degree of enigma and ambiguity to allow the listener space for their own unique interpretations. Published on Nov 30, 2018 Recorded live at Old Street Records, 19/11/18. Musically, the record draws inspiration from across the broad spectrum of British folk, American country and bluegrass, combining haunting melodies and intricate vocal harmonies with searing instrumental passages to create a stylistic blend that is at once familiar and unique. As of January 2019, Copper Viper has released two singles (‘Hung Up Alone’ and ‘Fly’) from the forthcoming album. These have been variously described as “a foot-stompin’ racket that’s a joy to listen to” (Americana-UK), “truly uplifting” (Fortitude Magazine) and “totally addictive” (York Calling) and are available on all major online streaming services. Cut It Down, Count The Rings will be released on April 5th 2019, with the album launch show taking place at London’s prestigious folk venue, the Green Note, on Saturday April 6th.